►Clayton Patterson pictured with members of the music group Dameht. 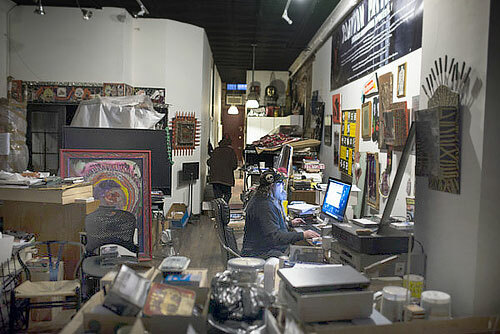 Clayton Patterson in his Lower East Side space. 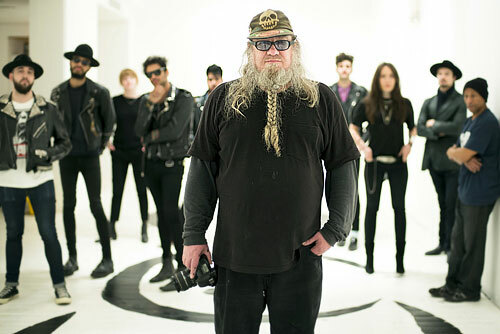 Almost from the moment he arrived from Calgary, Alberta, in 1979, Mr. Patterson’s world has been the downtown demimonde of squatters, anarchists, graffiti taggers, tattoo artists, junkie poets, leathered rock ’n’ rollers and Santeria priests. When he and his companion, Elsa Rensaa — she, too, is an artist — landed in New York, they took an apartment on the Bowery where their $450 monthly rent was paid by their jobs producing commercial art prints, and where one of their neighbors was the not-yet-famous painter ►Keith Haring. Gentrification can often gestate invisibly for years, and in the mid-1980s, as Mr. Patterson ►founded the Tattoo Society of New York and opened up the ►Clayton Gallery on the first floor of his home, The Village Voice was already reporting that major developers like Helmsley-Spear were investing millions of dollars on vacant lots and abandoned buildings in the neighborhood. Even as local rents began to rise, Mr. Patterson’s arts space was showing work by nontraditional artists like Hasidic Jews and the leader of a local motorcycle gang. Here were the conflicted seeds of an eventual transformation: On the one hand, corporate money was pouring in; on the other, Mr. Patterson was making custom baseball caps for rebel celebrities like ►Matt Dillon and ►Gus Van Sant. Then, on Aug. 6, 1988, hundreds of downtown residents clashed with the police in Tompkins Square Park in the East Village. The nominal issue was a 1 a.m. curfew imposed on the park, which had turned into an encampment of the homeless and a gathering place for what were described by many as skinheads, drifters and rowdy youths. As darkness fell, officers in riot gear descended on the crowd, and a nightlong melee followed. The park that night turned into something like “ ►a war zone,” The New York Times reported; more than 100 complaints of police brutality were lodged; and Mr. Patterson caught it all on tape. It was, in a sense, the height of his career as a documentary artist. The networks showed his footage on the nightly news, and journalists and academics called on him for quotes. While Mr. Patterson was able to capitalize on the attention and channel it into projects that later included a well-received photo exhibition, L.E.S. Captured, and a multivolume ►history of the Lower East Side’s Jews, for him the riot marked the moment when the city’s business interests and security apparatus joined forces and, in so doing, made New York unlivable. 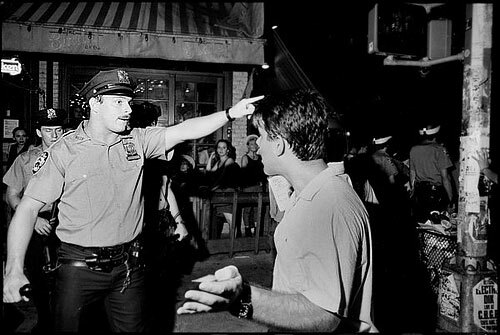 In 1988, downtown residents clashed with the police over a curfew in Tompkins Square Park. Complicating matters, his partner, Ms. Rensaa, had been suffering from memory loss since she sustained a blow to the head in the chaos of Sept. 11. Last fall, two intruders broke into their home while Mr. Patterson was out, and although Ms. Rensaa was not harmed, the experience scared her half to death. Mr. Patterson himself isn’t getting any younger — “I’m an overweight male,” he complained, “at the end of the road” — and so this winter, he decided it was high time to fashion an escape plan. He immediately thought of Bad Ischl, a spa town in Austria, where he has been involved with the ►Wildstyle tattoo and music festival for nearly 15 years. 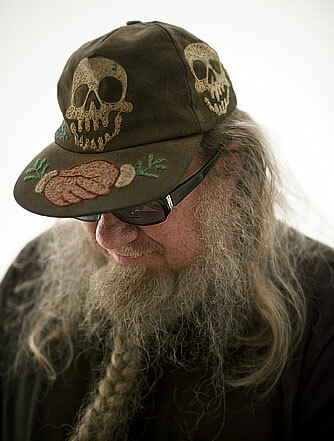 Mr. Patterson, in a hat he designed. On Apr 5, 2014 at 16:26 Jean M. Zimmermann <athenaw@erols.com> wrote to NO!art headquarters East <contact@no-art.info>: A departure I much regret reading in the New York Times the announcement, and justification, of Mt. Patterson departure to greener pasture. I have one wishful thinking: The Boris Lurie Foundation should buy your building and transform it in a NO!art study center.